Life's little details...: October Creative Carte Blanche! I cannot wait for fall...here in Florida we are expecting our first batch of fall weather! We are going to be in the high 70's and upper 50's at night!! That is heaven! 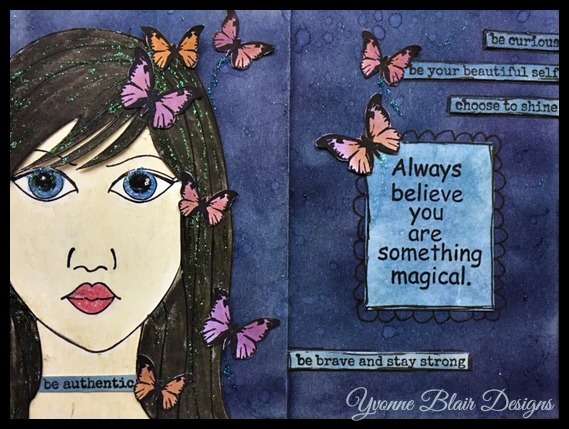 Today I'm sharing with you an art journal spread I did for the Creative Carte Blanche's October Witchy Woman Challenge. Candy Colwell is the hostess of this fun theme! It could very well be used as a Halloween prompt, but I chose to highlight a magical woman who has power over her thoughts and understand we all have gifts. As most of you know, I have a love affair with words. Words are important. They can be powerful. We must feed positive words to our inner selves. Sure there will still be hills to climb, but when we feel our self positive we have that strength to pull from. It gives us a real power to trust our inner voices and our abilities. I listened to the song Witchy Woman from the Eagles...I kind of used her as my inspiration for my own girl...of course will all the magic flowing through her veins, she had to have some magical dust, aka glitter, lol. 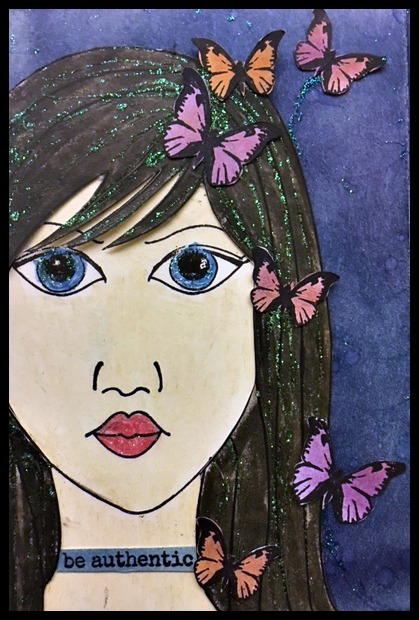 Her eyes are sparkly and her inner beauty draws the butterflies to help her celebrate. The message is clear. Always have faith in yourself. 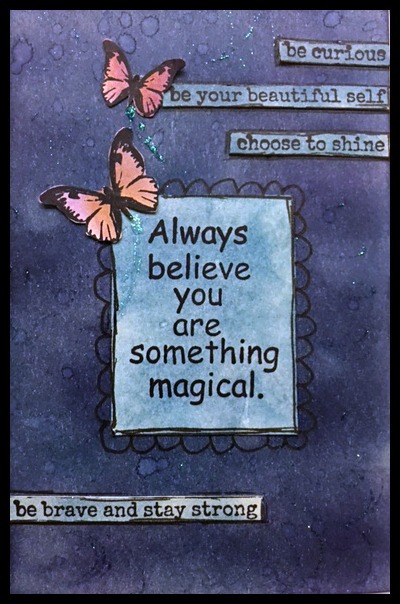 Always believe you have some magic running through your veins. God gave us free will...it is your choice to keep you power or to give it away. It is your choice to see things positively or negatively. What will you choose? I choose to be authentic to myself, to shine and to be strong...to have faith in my abilities and to most of all hopefully help other women to see these things, feel these things and embrace their own inner Witchy Woman! Thanks for stopping by and I hope you were inspired to get creative! If you haven't joined us yet this month...you still have time! We LOVE to see what you create and how you create! Labels: art journaling, Creative Carte Blache, Impression Obsession, mixed media. Totally love this one, Yvonne! It reflects your always positive messaging and is artistically pleasing. I'm kind of mesmerized by the bangs on your girl. Did you fussy cut those? Or add shadowing? Inquiring minds want to know. Love this my friend, and love you! Yvonne, Lovely witchy woman!! heehee Her eyes are truly engaging and the magic that surrounds her is beautiful!! well done!